Robert Stephen Beecroft is an American diplomat who was appointed U.S. Ambassador to Iraq in 2012. At the time of his appointment, he was serving at the embassy in Baghdad as Chargé d’Affaires. He served as U.S. Ambassador to the Hashemite Kingdom of Jordan from 2008 to 2011. In April 2011 he received the Diplomacy in Human Rights award. He has also been honored with the Department of State’s Meritorious, Superior, and Distinguished Honor awards. 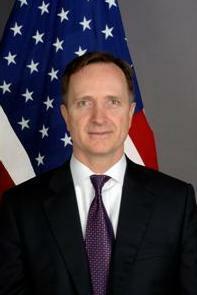 Beecroft is a career member of the Senior Foreign Service. He has specialized in Middle East affairs and has served at the embassies in Riyadh, Saudi Arabia, and Damascus, Syria. He previously filled assignments in Washington, D.C., as Executive Assistant to Secretaries of State Colin Powell and Condoleezza Rice and Special Assistant to Deputy Secretary of State Richard Armitage. He has also served in the Department of State’s Executive Secretariat and Bureau of Near Eastern Affairs. Before joining the Foreign Service, he practiced law in an international law firm in San Francisco, California. Beecroft is a member of The Church of Jesus Christ of Latter-day Saints. He received his BA degree from Brigham Young University and his JD from the University of California at Berkeley. He served a full-time LDS mission to Venezuela. Beecroft is married to Anne Tisdel Beecroft, who has a BS and JD degree from Brigham Young University. They are the parents of four children. This page was last edited on 24 January 2014, at 15:24.